For centuries, Boston Harbor and its islands have been an integral part of the city's culture and economy. Today, the islands comprise one of the most unique National Parks in the United States. Consisting of thirty-four islands and mainland parks, the Boston Harbor Islands National and State Park is the largest recreational open space in Eastern Massachusetts. Located only minutes from busy downtown Boston, the islands provide visitors and tourists alike a welcome escape from hectic city life. During the summer, visitors can catch a ferry to six of these islands from Boston, Hull, and Hingham. 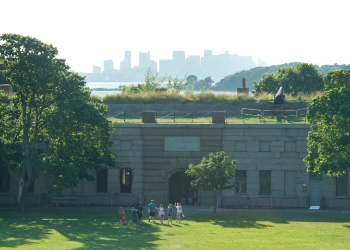 "We offer a wide range of programs that keep people on the islands, but for many, the islands themselves are the attraction," explains Jessica Renehan, Program Coordinator for the Boston Harbor Islands National and State Park. "We have five miles of hiking trails, a Civil War-era fort, activities, camping, and more." Georges Island and Spectacle Island are the most popular destinations for day visitors, while many of the other islands are open throughout the summer for overnight camping. "Spectacle Island is where we have most of our recreation programs," Renehan says. "We have yoga classes for the public, a tai chi program, Sunday jazz concerts from the Berkeley School of Music, Monday kayaking, and kids activities, just to name a few. And almost all of this programming is free." As Renehan points out, organizing and running such a busy calendar of events can be challenging. "If you forget something, you can't just run down the road and get it," she says. "Sometimes we have to get really creative, and it can be a challenge figuring out how to get all of the supplies onto the islands. We're also more susceptible to weather than other places. It could be raining on the islands while it's sunny in the city." Georges Island is home to Fort Warren, a military fort that was built in 1783 and was active through World War II. 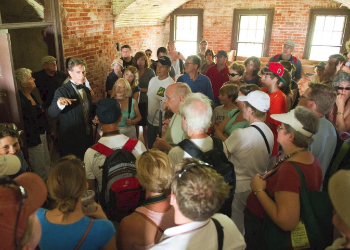 The fort was declared a National Historic Landmark in 1970, and today, it is open to the public for exploration. "A lot of forts that you visit are closed off to the public. You stand on the outside wishing you could get it," Renehan says. 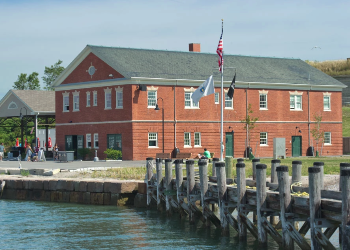 "But visitors get complete access to Fort Warren. You can get inside, explore the rooms, find really cool nooks and crannies. There's one dark tunnel inside the fort that's about twenty-five yards--it's pitch black and people bring flashlights. You can feel like a kid and go exploring." Even in an area as historic as Boston, Fort Warren is a one-of-a-kind experience. "There are so few sites in New England with a real connection to the Civil War," Renehan explains. "Fort Warren is really one of the only ones. During the Civil War, it operated as a POW camp for Confederate soldiers. It was well known for being a really humane place, and that's really why it's a landmark. There were over two thousand soldiers out there during the war, but only thirteen died." Despite this, Georges Island has its share of spooky tales--most notably, the Lady in Black, a Civil War-era ghost who, according to the story, was executed as a spy after a failed attempt to free her imprisoned husband. "The story of the Lady in Black is a huge draw. People come out just for the story, and many of them know about it before they get here," Renehan says. "We've incorporated the Lady in Black into our programming. The story isn't actually true--it was created as a way to conjure up awareness for Fort Warren and Georges Island. At a time when the fort was decommissioned, the city planned to use it as a dumping ground for hazardous waste. But local historian and lover of the BHI, Edward Rowe Snow, made up the story as a way to draw people to the islands." Evidently, it was an effective approach. Today, the islands draw half a million visitors every year. Whether a history buff, a yogi, or a family traveling with kids, the BHI offers more than enough for a full day of summer fun. "It's only a short boat ride away from the city, and it's a place where people can connect with nature," Renehan says. "They can be somewhere that feels miles away from hectic city life.